Nature’s Way has been providing natural supplements for both men and women for many years. 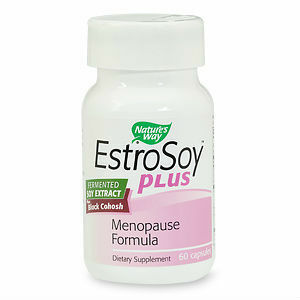 Among their highly acclaimed products is EstroSoy Plus, a supplement created especially for women in menopause. Claiming to relieve hot flashes and night sweats, support breast health, and promote bone health, EstroSoy Plus addresses some of the concerns felt by women during this transitional stage. After researching reviews, it seems women have witnessed success while using this product. Due to this fact, let us delve deeper into this product. Users of EstroSoy Plus are instructed to take 2 capsules per day with water. There is no indication of a particular time of day when these capsules should be consumed. EstroSoy Plus can be purchased on Walgreen’s website for $16.99. With each purchase, customers will receive 60 capsules. Calculated with dosage, this is equivalent to a 30 day supply. There is no indication that customers can receive any form of a discount. While researching this particular product, no guarantee could be found. A supplement product that is not covered by a guarantee should be approached with caution. If purchased and results are unsatisfactory, customers have essentially lost their investment. Based upon the information provided above, it seems that Nature’s Way does provide a reasonably priced product that can help with certain aspects of menopause. However, researched information also reveals a couple of negative elements which should be brought to the attention of new customers. The first element concerns the benefits. Although EstroSoy Plus does help keep the body healthy during menopause, it only addresses one symptom. Women in menopause often experience many symptoms that hinder sleep and daily routines; therefore, relief is highly desired. If EstroSoy Plus only relieves one symptom, multiple medications will have to taken, thus increasing the daily consumption of pills. The second element of concern is the lack of a guarantee. As stated above, no guarantee creates a risk factor for all customers. If consumers have no success with this particular product, there is no way to retrieve their money, thus creating the sense that money has literally been thrown away. Jackie Horowitz	reviewed EstroSoy Plus	on October 29th	 and gave it a rating of 2.